As pioneers in the North American Funeral Profession of the Green Funeral movement we concentrated on two main areas of interest; Caskets and Embalming Fluid. It is important to note that often choosing an environmentally responsible service or product means paying more. We have made significant efforts to ensure choosing the environmentally responsible options will not increase the funeral costs to the families we serve. Conventional caskets are finished with a number of petrochemical products such as lacquer, varnish, urethanes and varathanes. All of these products convey at least some level of harmful emissions when interred or cremated. Our line of environmentally friendly caskets is finished in 100% natural oil, using natural pigment applied in three involved and critical stages. This process allows for retention of an attractive finish without the use of petrochemicals. This finish is a breakthrough for the casket industry in the true spirit of conservation. 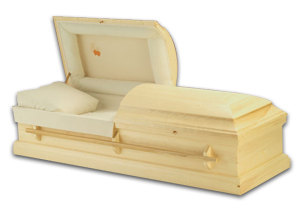 The interior of our environmentally friendly caskets is made from cotton and cellulose materials, eliminating petrochemical based materials contained in conventional caskets such as rayon, nylon, acetates, plastics and polymers. 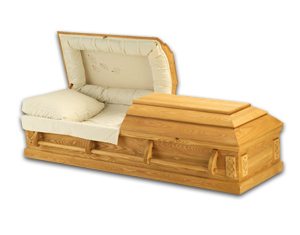 Bedding for our environmentally friendly caskets is provided by using 100% wood excelsior covered by 100% cotton mattress cover. 100% cotton is used for pillow stuffing to provide superior function in this area as well. We believe in the value of environmentally friendly caskets so much, that we allow families to purchase caskets from us even if they offer to use the services and facilities of another funeral home. There is no charge for local delivery, however there is a mileage fee for deliver outside of Waterloo Region. Many people choose cremation over burial because they think cremation is better for the environment. While it is true that cremation does not take up any space, it is also true that cremation creates air pollution. Some of the pollutants found to come from the smokestacks of crematorium include heavy metals, hydrogen chloride, dioxins and furans. One well respected author writes, "Anyone with green pretensions should think twice about cremation, which pollutes the atmosphere with dioxin, hydrochloric acid, hydrofluoric acid, sulfur dioxide and carbon dioxide." There is also an enormous amount of fossil fuels used to accelerate and sustain the fire which can reach temperatures of 1400 degrees to 1800 degrees Fahrenheit.